Today we crossed the border from Kenya into Uganda (stamps 3 & 4). 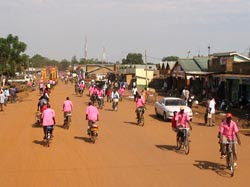 It is very entertaining to see all the Ugandan taxi's at the border - the guys in pink shirts on their bikes. "You may want all these things (with a picture of a young woman and thought bubbles of perfumes, cellphones and cars), But you don't want HIV/AIDS. Say NO to Sugar Daddies"